Small Angle X-Ray Scattering (SAXS) allows us to reconstruct the structure of a carrier, either alone- or loaded with a drug. 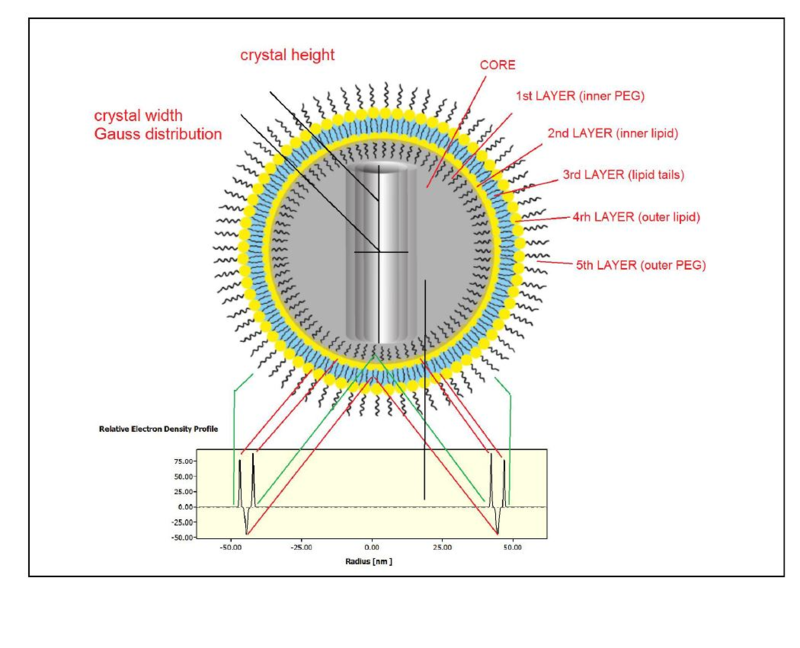 As an example; for the case of doxorubicin loaded in liposomes, we are able to obtain information about the thickness and density of lipid bi-layers, the PEG corona and the dimensions of a nanocrystalline loaded drug. The model of the system is presented below. An application note with an example of a SAXS analysis of the sodium dedecyl sulfate (SDS) micelle is available here. The lung and nasal delivery routes are commonly used for aerosols. This is a promising delivery route, yet accurate and repeatable dosing remains a technological challenge. Once a pressurized dose of an aerosol is delivered to the sampling surface, the most important factors to control using XRPD are the polymorphic contents of the API, the quantity of the API within one dose and the dose repeatability. Drug carriers (i.e., microspheres, liposomes, nanoparticles) may be accessed using SAXS and complementary methods when entering the fluid phase. The characterization of liquid formulations is similar to that used for the characterisation of drugs with an injection delivery route, and are performed using the SAXS methodology. Characterization of liquid-crystal-based formulations is performed using a combination of SAXS and XRPD techniques. Please follow this link Devices and materials for more information.